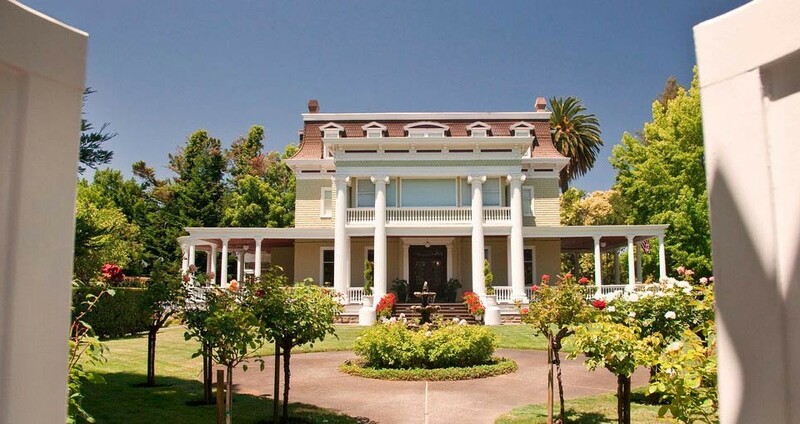 We look forward to welcoming you to our Napa bed and breakfast! Take Highway 380 West 2 miles to Highway 280 North. After 6 miles, bear Left onto 19th Avenue/Highway 1. Continue through San Francisco for 7.6 miles. Cross the Golden Gate Bridge and drive 20 miles to the Highway 37 Exit. Travel East on Highway 37 for 7 miles and turn Left at the Highway 121/12 intersection. Go North for 6.5 miles and stay in the Right lane at the stop sign continuing onto Highway 121/12. Drive 7.1 miles to the traffic light and turn Left onto Old Sonoma Road. Drive 4 miles to the end of Old Sonoma Road and turn Left onto Jefferson Street. Travel about one-half mile, past Fuller Park, and turn Right onto Oak Street. Drive 7 blocks to the corner of Oak and Brown Streets and turn Right. Churchill Manor covers the southwest corner of Oak and Brown Streets. Pull into the first parking lot on your Right side. Welcome to Churchill Manor! Take Interstate 80 East across the Bay Bridge. After crossing the Bridge, move to the Left lanes and follow the signs toward Sacramento. After traveling 20 miles, you will come to the Carquinez Bridge. Pay the $4.00 toll and continue on Interstate 80 for 4 miles to the Highway 37 Exit. Drive West on Highway 37 for 2 miles and take the Highway 29 (Sonoma Boulevard) Exit. Turn Right onto Highway 29 at the base of the Exit. Travel 7 miles North on Highway 29 until you come to where the road splits to the Left and Right. Stay to the Left toward Calistoga and drive 5 miles and take the First Street/Downtown Napa Exit. Drive about one-half mile to the first traffic light at Jefferson Street and turn Right. Travel 2 blocks and turn Left onto Oak Street. Drive North on Highway 880 and follow the Interstate 80 East/Sacramento signs. Once you are on Interstate 80 East, travel 20 miles, and you will come to the Carquinez Bridge. Travel North on Highway 680 past the City of Concord and keep in the Left lanes as you approach the Benicia Bridge. Pay the $4.00 toll and drive West onto Highway 780 toward Vallejo. Travel about 10 miles and take the Interstate 80/Sacramento Exit. Drive East on Interstate 80 toward Sacramento for 3 miles and take the Highway 37/Napa Exit. Travel west on Interstate 80 past the City of Fairfield — about 50 miles. Take the Highway 12 WEST Exit. Drive 8 miles to Highway 29 and turn Right. Drive 3 miles until you come to where the road splits to the Left and Right. >Pull into the first parking lot on your Right side. Welcome to Churchill Manor! Travel South on Highway 101 for 15 miles to the City of Petaluma. Take the Highway 116/Lakeville Highway East exit towards Napa/Sonoma. After 12 miles, take Highway 121 North. Drive 7.1 miles to the signal and turn Left onto Old Sonoma Road.